I have been knitting quite a few things lately, but as most of them are gifts I am reluctant to post them until they've been given! I can post a picture of these snowmen ornaments I've been working on. I'm making them for the kids of my friends. So far these two are the only ones I've finished. 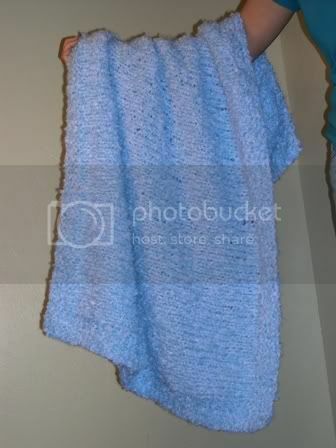 I hope to make a total of at least seven - now that I've gotten the pattern down, I'm going to knit all the pieces first and then assemble them all at once. 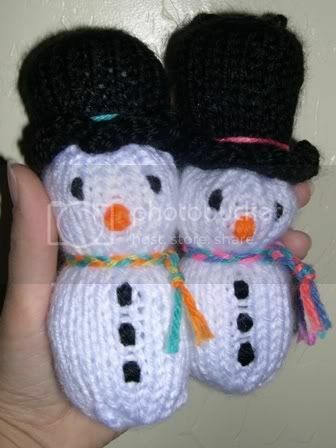 I got the pattern from Knit List here: Snowman Ornament Pattern. One change I made to the pattern was to not knit the colored stripe on the hat - instead I knitted the whole thing in black and then tied a piece of yarn around the base. I also knitted the ornament with size 10 needles, making it larger than it would have been with size 7. I'll be knitting like crazy this week so I can finish all my gifts soon!